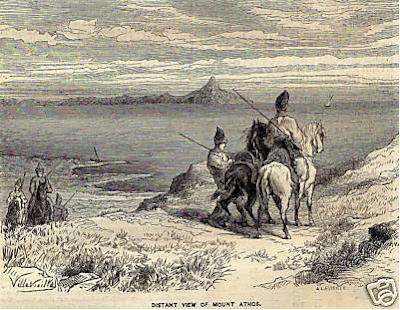 The Turks first invaded the Holy Mountain of Athos in the year 1812, spreading panic to all its inhabitants. The ancient monasteries were devastated, and the monks suffered violence and banishment. Though some monks remained without assistance or protection, most fled the peninsula to preserve their lives. A second invasion took place in 1821. The Turks occupied the Holy Mountain for nine years. On the Sunday of Saint Thomas, 13 April 1830, the Turks abandoned the Holy Mountain. 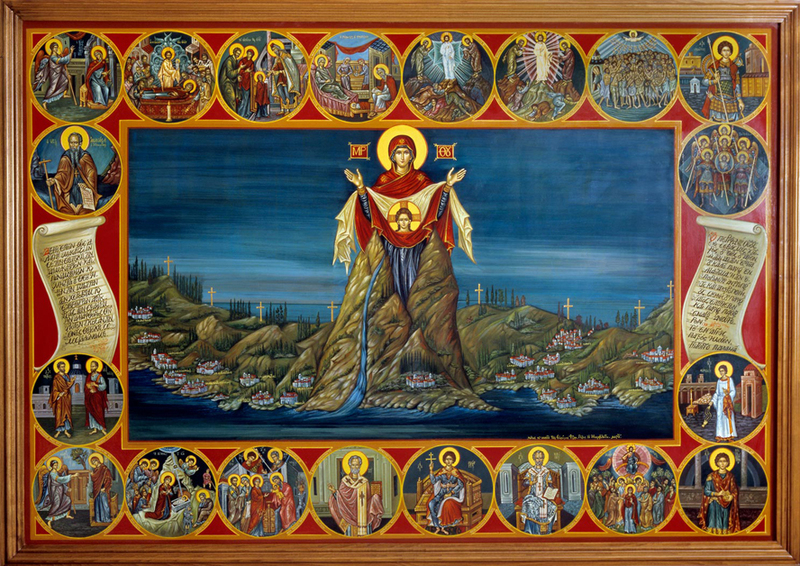 This liberation is annually celebrated by the monks of Mount Athos on the Sunday of Saint Thomas. When the Turks invaded Mount Athos in 1821, they came to Iveron Monastery. The monks fled to the nearby high country, but the sick and the elderly stayed behind, awaiting whatever death the Turks chose for them. Hierodeacon Gregory Bouyatsas, who was a young monk at Iveron at the time, records that the Turks began to slaughter each monk as they came upon them. Hierodeacon Gregory himself was tortured by the Turks. One night, as the Turks were patrolling the monastery, they saw a Woman holding her Son in her arms. She was walking towards the chamber where the vessels were kept, which is also where the chief of the marauders dwelt. When the chief was informed of this by the watchmen, he asked for Hierodeacon Gregory to be brought before him. He questioned him why he kept a woman concealed there. Father Gregory, surprised, answered that there were no women there, nor anywhere on the Holy Mountain, and that perhaps the watchmen mistakenly saw a woman. Being late at night, Father Gregory was dismissed, and in the morning a search was made for any women in the area, but none were found. Not long after this, the same Woman was seen walking towards the bakery. The patrol reported this sighting to the chief. He became angry and called for Father Gregory, thinking he was lying to him about the presence of women. For this, Father Gregory was whipped and made to wear iron shackles until he confessed the truth. Then he was bound to a cypress tree behind the church, and twenty-four soldiers took turns torturing him until he revealed the location of the Woman. Gregory did not utter a word, and endured everything without murmuring. The next day, Gregory was loosed from his bonds, but the interrogations continued about the unknown Woman. 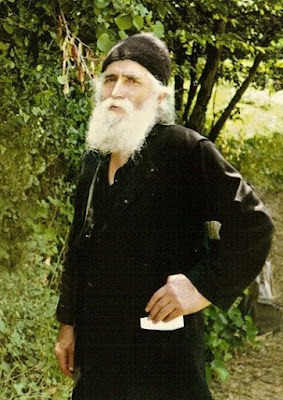 Gregory then had the chieftain follow him to the Chapel of the Panagia Portaitissa, and showing him the wonderworking icon of the Panagia, said: "Behold, she is the Woman who you saw going to the storehouse and then to the bakery! I am prepared to die for her, even now, so do not spare my life." The Turk realized that Father Gregory was speaking the truth, so they let him go free, and even asked that they be pardoned for the mistreatment they showed him. On the 13th of April in the year 1830, which was the Sunday of Saint Thomas, the Turks suddenly abandoned the Holy Mountain, and did so in haste. No one knows exactly why, but to this day it is believed to be due to a miracle of the Mother of God. Consequently, splendid doxologies were offered up to her by the monks of Mount Athos. 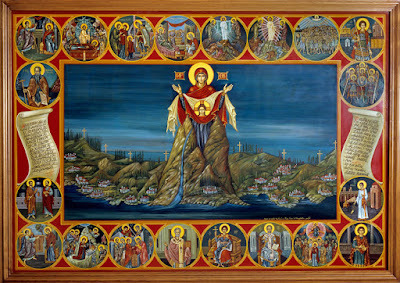 As a day worth remembering, till this day the monks of Mount Athos celebrate their deliverance and liberation from the Turks on the Sunday of Saint Thomas, with every monastery conducting a vigil and procession. The good God ordains everything in the best way, but much patience and care is needed, because many times, when people struggle to free themselves from the net, they get tangled further. God with patience untangles them. This situation will not go far. God will take a broom! In 1830, because there were many Turkish soldiers, for a period of time, at Iveron Monastery on Mount Athos, there did not remain a single monk. The Fathers had left, some with the Holy Relics, some to help in the [Greek] Revolution. One monk would come from afar to light the vigil lamps and to sweep. He prayed once with pain to the Panagia, and he beheld a woman approaching — it was the Panagia — who shone and whose face was radiating light. And she began to sweep. Later she disappeared into the Holy Altar. And in three days, all of the Turks had left! They were cast out by the Panagia. Who can rightly tell of your goodness towards us, the saving appearances and gifts, O Virgin Theotokos? For your Holy Icon wondrously passed over the waves and was granted to us as a divine treasure, and a pledge of salvation. Through your invisible presence, you care for us, and you drove back the foreign army that had troubled your Mountain. Therefore, we celebrate a dual feast: the receiving of your wonderworking Icon, which we praise, and the deliverance from the tyrannical siege. We cry out to you: ever protect and keep us, as you are our protection and defender, as I call you the Most-blessed One.